As many of you know, today is the day that Step Up! supporters will not upload a single texture to the grid for a whole 24 hours! "I am not necessarily in the mind set that it will do anything to stop content theft, but I do think that it will make Linden Labs realize that this isn't just a bunch of content creators throwing themselves on the floor, and pouting like a 2 year old. SL has become just as dangerous for designers to create, as it would be walking down a dark alley in the middle of the night. It's is a risk to put yourself out there, and you never know if someone is waiting for you around the corner, ready to attack you and steal your belongings. So yes, again, I think it is a great way to get the Linden's attention, and I am supporting it. But it will be pointless for content theft because there will always be hackers and assholes as long as there are computers on the planet, and they can never be stopped." 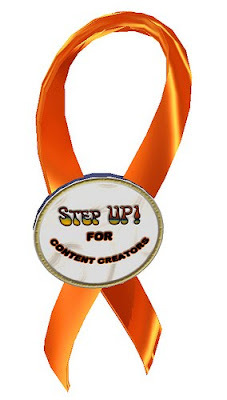 If you want to support Step Up!, feel free to join the group in world, or just refrain from making any uploads for 24 hours (just on November 5th). I was also told about another group that is putting a stop to any kind of L$ transactions, as well as absolutely no content creation what so ever, and is asking stores to completely close down for 48 hours. This, I do not agree with, but if you do, feel free. The less money we give to Linden Labs, the more they will realize there is an issue.